All our training courses are held ‘in-house’, which means we travel to you, saving you time and travelling costs. Our courses are tailored for individual and companies' needs. We do not run generic courses aimed at people from multiple companies. However a number of the courses that we run may only consist of one or two delegates. These small courses ensure we move at the pace of the delegates; as fast or slow as necessary, as deep into the subject as appropriate and with as much development as possible. Please tell us your preferred dates and we will arrange a course to meet your needs. In-company: We run most of our courses at our client's premises or their preferred venue. We will provide data projector, video and other equipment to make their training stimulating and meaningful. We will reduce this cost if we run a number of courses for you. Our one-to-one training at your premises can be as little as £900. Please contact us for a quote. We are registered for VAT and will add the current rate to our cost. Before undertaking a training event our training consultants will contact you to establish your requirements. They will be keen to gain knowledge of the people involved and an understanding of your working practices and organisation’s culture. This helps us ensure the training relates to individual’s and the company’s needs. 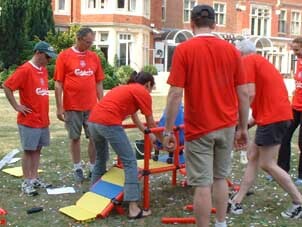 Because each event is unique and tailored to client’s needs, it is difficult to give a general price for a team building event. The cost will also vary depending on the location and number of delegates and tutors. Our "Who Done It?" event takes place in the pleasant countryside at Martlesham Heath, near Ipswich. We also use many locations throughout the country for our other activities. Some are at clients premises; others at hotels chosen by our clients; others recommended by us. If you prefer we will arrange everything from accommodation to meals and joining instructions – all you do is to agree on a programme and a venue from our extensive range. Alternatively, you tell us where you are holding your event and we will arrange suitable activities for you. We are registered for VAT and the current rate will be added to our cost. Before undertaking a training event our consultants are keen to gain knowledge of the people involved and an understanding of your working practices and the organisation’s culture. This helps us ensure the training relates to individual’s and the company’s needs.